That should do it.. Let us know If everything works ok. I'd like to add the TN565t folks to the skin updates....does anyone have a data.zip? Just grabbed one yesterday and haven't had time to do anything to it yet. I'll try and get you one soon as I'd love to see some skins! Yes, thanks that is what jogged my memory! Thanks RamRod that worked like a charm. Just purchased this unit off ebay for $75, with two years left on MotoExtras and two year left on a squaretrade warranty. This is looking like a nice unit after a few changes, to bad Moto has left this unit out to in the cold. My old HP Ipaq 310 was dieing a slow death, but was a great unit after modding it. Will be checking back to this forum often a lot of good information. Your welcome. Sounds like you got a good deal. Happy Navigating, I think you will like your new purchase. Let us know what Data version you are wanting to download. Some of the links still worked for me and some didn't. I will be gone for a few hours today, when I return I will check to see what version you want and see If I can upload the link for you. note: google.docs is doing something strange...wait for it to load and select file/download. rename to data.zip and place in motonav folder on pna. Just went to Google Docs via the URL above and I initially was presented with a huge list of files (2053) - apparently an unzipped listing of DATA_moondog1.zip. I had to go to the File menu of Google Docs (not your own browser File tab/menu) and was presented with "Download original", which I did an it downloaded the original zipped file. Seems to all be OK. Just never encountered this scenario before. i think you accessed the contents of the zip file. that's what i think the link is. you need to go up one level to view the files which include the zip file. Hey guys, I'm new to this but I think what is being done is awesome. Especially since it doesn't look like there will be any more support (what little there was) from Motorola. I love the skins and have been testing them out and liking them. But I was just wondering if anyone knew how to add just the "current street" displayed exactly where it shows on the skins? So basically what I am asking is how do I add just the "current street" to the stock skin and where do I put the text and in what file? If anyone can help me out that would be awesome! Everyone keep up the incredible work! Thanks. Is there a working link for the skins? i want to see the sun rise and sun set (on my 765)! come on, araq! you know i drive back from TN on Wed night. i see the chnange occur (it's cool) but i don't see the sun actually set. but. but. but then. but then, i'm going south and east so i wouldn't see it. BTW got the 3rd one changed to match the other 2. GPS search is not getting result well, what's the best way to search POI? Now, check the size of the RR6.9a data zip, it should be 12.7 mb in size....and, it should be appearing as a zip file, correct? If everything is correct, so far, then rename the RR6.9a data zip file to just DATA (in capital letters as shown here). Now, copy the zip file with the new name DATA onto the Motorola folder, not "in" it. I`m only guessing you may of not renamed the datazip before copying it and that may be why it`s not working for you right now. Try this procedure, and let us know if this works for you. As per finding the most local POI`s, when you start your search for a place, first type in either the correct town`s name, or zip code, before you search for the place that you`re looking for, and see if that helps you locate whatever item/place that is nearest to your location. I only have Motonav folder and file GC550.WPH..
Ok, when you connect your tn765 to the pc, and "open" it.....you should see......the Motonav folder, then the Content.chk file, and then the GC550.WPH file, only. You should see, just these 3 items, only.....the datazip should not be visible at this time. At that point, drag and drop the DATA (zip file) onto your Motonav folder,and you should see a short "visual" of the files being copied, and that should be all there is to it. That, is the normal procedure on how do this. At that point, close the window showing the Motonav folder, Content.chk and the GC550.WPH files showing, and safely disconnect your unit from the pc and let it boot up normally, you should not have to do any kind of reset, what so ever. IF........the skin still doesn`t show up after booting your unit up, reconnect your tn765 back to your pc, open the folder that is the Motonav folder, and verify that the datazip IS visible in the line up of the files now showing. I have done this procedure, dozens of times, and have never had the results you are currently having....if all "looks" good, then I`m currently at a loss as to why it`s not working for you. But, I will........keep pondering your situation. Content.chk is only 1kb, is this correct? to upload picture, how do I do this? Do you need take pic with camera and upload into this post? You say when you open your files on your Moto, you are seeing the Motonav folder, (2.25 gig in size), the Content.chk file (20bytes in size) and the GC550.WPH file (0 bytes in size) AND that DATA file too? That is where your problem is lying......you should ONLY see the Motonav folder, the Content.chk file and the GC550.WPH file......nothing else. Since you are saying that you are also the DATA file there, drag that DATA file to the Motonav folder (in other words, move it there,) then safely disconnect your gps from the pc, and let it boot up normally....see what happens at that point, ok? Where can I get Content.chk 20bytes ? Well, the only option I`m aware of is ......(assuming you had made a backup of your system via the toolbox)......is to re-open your Motonav folder, delete the datazip from it, then safely disconnect your unit, again. 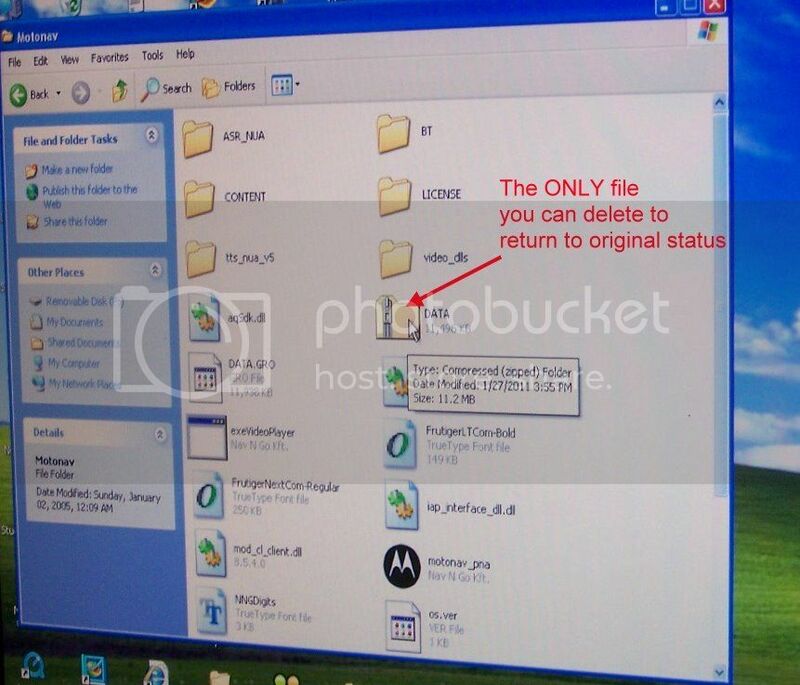 Then.......start up the toolbox, connect and turn on your tn765, and once it`s recogninzed thru the toolbox, do a "system restore", and it it should take approx 10-15 minutes to completely restore the files that you had when you had first backed it up. However, be sure you have a full battery charge on your unit before you start the restore process.....as it could take longer, depending on the type/speed of your pc. Afterthought........your Content.chk file appears to be perfectly ok, it WILL show up as 1kb normally. It`ll only show 20bytes in size, depending on which O/S your currently using. However, it woiuldn`t hurt to restore your unit (if you had backed it up) and start over again, trying to copy/paste the DATA zip file you`re currently working with. That way, you`d have a "fresh start" on installing it (the datazip). Yes, the reason that particular datazip is a bit smaller in size is because it`s a picture of a different skin version. But, the procedure, and the folder results, are still the same, regardless of which of several different skins that were available at that time. That particular picture you`re referring to, is a "file" picture, I took over a year ago when helping out another individual. But, back to your problem.....I just don`t understand why your skin isn`t showing......this is as frustrating for me, as it is for you right now. I`ve just never encountered this particular problem before when adding a skin to a tn765 or a tn765t.....and I`ve done this procedure to literally dozens of units over the last few years. Spyder, BlueTOOTH, Camel, TL.....you guys got any other ideas on why this is happening to wisejayc? How did you upload your folder pictures?